Canadian prosecutor John Gibb-Carsley said in a court hearing Friday that a warrant had been issued for Meng's arrest in New York on Aug. 22. He said Meng, arrested en route to Mexico from Hong Kong, was aware of the investigation. China summoned the U.S. ambassador to Beijing on Sunday to protest the detention of a senior executive of Chinese electronics giant Huawei in Canada at Washington’s behest and demanded the US cancel an order for her arrest. Meng’s arrest has threatened to increase U.S.-China trade tensions and shook stock markets globally last week. But U.S. Trade Representative Robert Lighthizer, speaking on CBS’ “Face the Nation,” downplayed the impact of the arrest on trade talks between the two countries aimed at defusing the tensions. “It’s my view that it shouldn’t really have much of an impact,” he said. The surprise arrest raises doubts about whether the trade truce will hold and whether the world’s two biggest economies can resolve the complicated issues that divide them. The U.S. alleges that Huawei used a Hong Kong shell company to sell equipment in Iran in violation of U.S. sanctions. It also says that Meng and Huawei misled American banks about its business dealings in Iran. Roland Paris, a former foreign policy adviser to Canadian Prime Minister Justin Trudeau, said that Chinese pressure on Canada’s government won’t work. “Perhaps because the Chinese state controls its judicial system, Beijing sometimes has difficulty understanding or believing that courts can be independent in a rule-of-law country. There’s no point in pressuring the Canadian government. Judges will decide,” Paris tweeted in response to the comments from Beijing. Gibb-Carsley alleged that Huawei had done business in Iran through a Hong Kong company called Skycom. Meng, he said, had misled US banks into thinking that Huawei and Skycom were separate when, in fact, “Skycom was Huawei.” Meng has contended that Huawei sold Skycom in 2009. 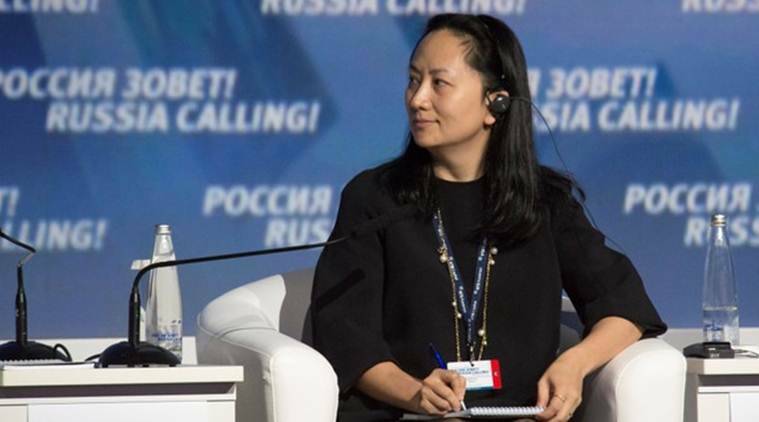 In urging the court to reject Meng’s bail request, Gibb-Carsley said the Huawei executive had vast resources and a strong incentive to bolt: She’s facing fraud charges in the United States that could put her in prison for 30 years. The hearing is to resume Monday. Huawei, in a brief statement emailed to The Associated Press, said “we have every confidence that the Canadian and U.S. legal systems will reach the right conclusion.” Canadian officials have declined to comment on Chinese threats of retaliation over the case, instead emphasizing the independence of Canada’s judiciary along with the importance of Ottawa’s relationship with Beijing.